The Ebac Neptune Dehumidifier is a small to medium capacity dehumidifier incorporating all the high quality engineering needed for heavy duty operation in hostile environments. While designed with the restoration specialist in mind this unit is also suitable for a variety of industrial, commercial and domestic applications where conditions are such that less capable dehumidifiers would be ineffective. This is a tough and dependable dehumidifier capable of performing efficiently in conditions of low temperature. The Ebac Neptune Dehumidifier is a powerful dehumidifier in a compact package. With external dimensions of 29 x 20 x 26 inches it can be used in smaller areas with limited floor space and placed where it can most effectively do its job. It is small enough to be moved easily between locations and will fit into any transport vehicle or even the trunk of a car. The Neptune is portable and is provided with an integral, fold-away carry handle to make movement easy. The robust engineering of its key components naturally make this unit heavier than a room dehumidifier but its 60lb should not make it unmanageable and it is light enough to be loaded on to and unloaded from a vehicle by a single operator without mechanical or human assistance. The unit is simple to operate with the minimum of complexity which helps to make this dehumidifier one of the least expensive for restoration work. Despite its small dimensions the Ebac Neptune is capable of extracting 51 pints of water per day in conditions of 80°F and 60% relative humidity. In the much more humid conditions of a restoration site this unit will extract more, up to a maximum of 13 gallons at saturation. This provides effective dehumidification for areas of up to 800 sq ft (manufacturer's recommendation) making this dehumidifier useful in a range of smaller and medium sized jobs. Not only the atmospheric conditions are tough in restoration work and the Neptune dehumidifier is tough enough to withstand them. A rugged steel chassis and casing provide a secure base and solid protection for the unit and an epoxy powder coating completes the defence against the inevitable impacts and occasional rough handling that units used for its designed purpose have to withstand. The Neptune is tough on the inside too, with a high efficiency rotary compressor and other components to match. All in all this amounts to a package that is not only effective but also durable and reliable. 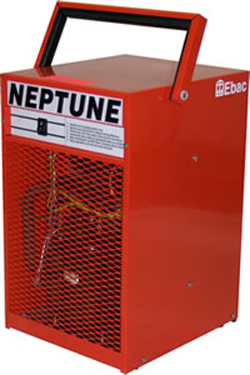 Like all Ebac restoration dehumidifiers the Neptune can function at very low temperatures. This is achieved by Ebac's own hot gas defrost system which automatically melts the ice that forms on the refrigeration coils of a dehumidifier. The incorporation of this feature enables low temperature operation down to 33°F. Simple and small enough to be operated by a single person the Neptune can also be left to work unattended due to its capacity for continuous drainage. This system operates by means of a gravity feed and therefore the dehumidifier needs to be close to a drain or other outlet at a level below that of the discharge port on the unit. In the interests of keeping the cost of the Ebac Neptune within limits there is no internal condensate pump so a separate pump would be required if the nearest drain is too far distant or at a higher level. The noise output from this unit is, at 57dB no higher than many room dehumidifiers which is commendable in a heavy duty unit such as this. This benefit may more appreciated by some other users of this dehumidifier, especially home users who may find this unit ideal for a wet basement or a cold garage.